Overland Expo East 2018: ­­­­­­­­­­Mud. Adventure. Some think that overlanding is just a fancy word for camping but it's much more than that. Overlanding is a term to describe exploring by your own means, usually by vehicle or motorcycle. The journey is just as important as the destination and camping is just one part of the equation. We recently attended the Overland Expo West and were drawn in by not only the wide range of vehicles but also by the great assortment of top-quality camping gear. Navigating the sea of rooftop tents, expedition trailers and fold-out awnings we came across some unique gear to enhance any campsite. Here are the top 5 camping products from the Overland Expo West for setting up your next overland camp. 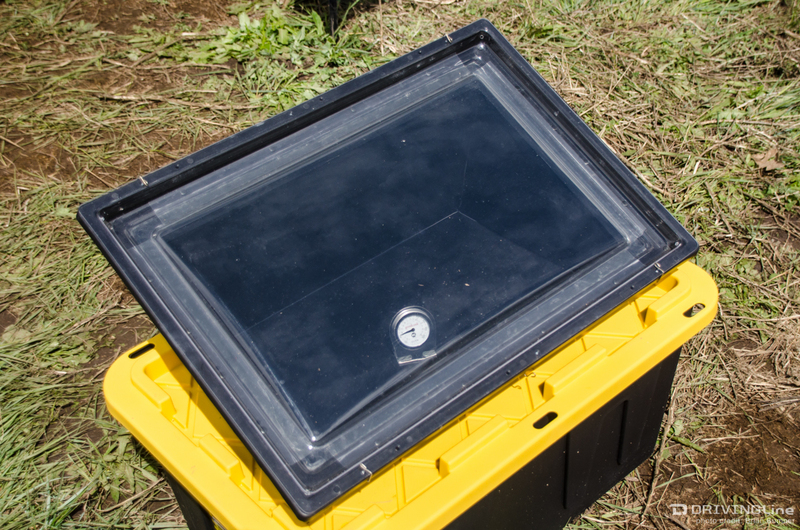 The Solavore Solar Oven uses the sun to slow cook your favorite camp recipe similar to a crockpot. Set it up in your camp and then when you come back from the trail or a hike, your dinner will be ready! The only fuel required is the sunshine and an optional reflector can be used to intensify the heat. The oven weighs just 9 pounds including the two 3-quart pots provided and is portable. Unfortunately the Expo's weather was less than ideal for demonstrations but there was just enough sun at times to warm up some chocolate chip cookies, which really hit the spot in the cold and rainy weather. 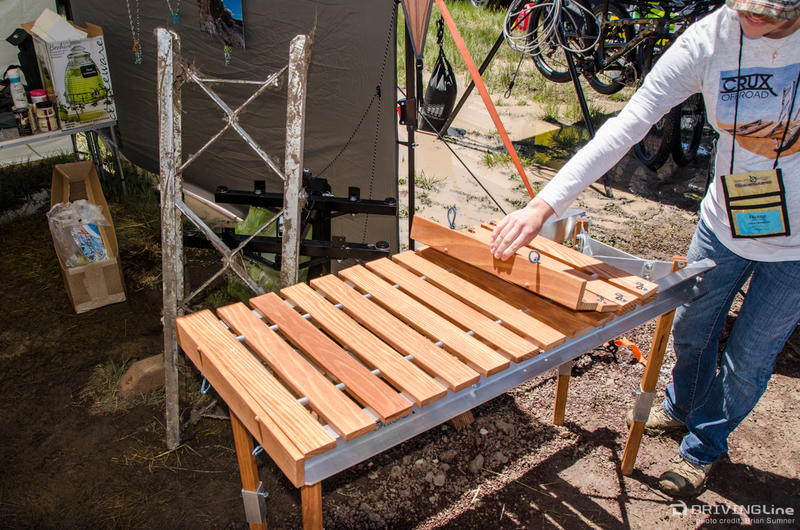 The Crux Off-road bridging and traction ladder is a recovery product that doubles as camping furniture. With optional accessories, the ladders can be used as a table or bench, eliminating the need to carry both and saving space in the process. The wooden top slides into place and is secured with shock cord while the legs are attached with thumb screws. The traction ladders got a workout being used by event volunteers to recover stuck vehicles in the muddy camping field. Now you can bring everything, including the kitchen sink, with Tembo Tusk's camp table system. The tables break down for easy storage and are made from steel and bamboo plywood with stainless fasteners. With several options including a wash basin, lantern hanger and paper towel roll holder, the tables can be configured to suit your specific needs. Also on display and in use all day long was the Skottle, a South African cooking contraption providing various food samples to expo attendees. 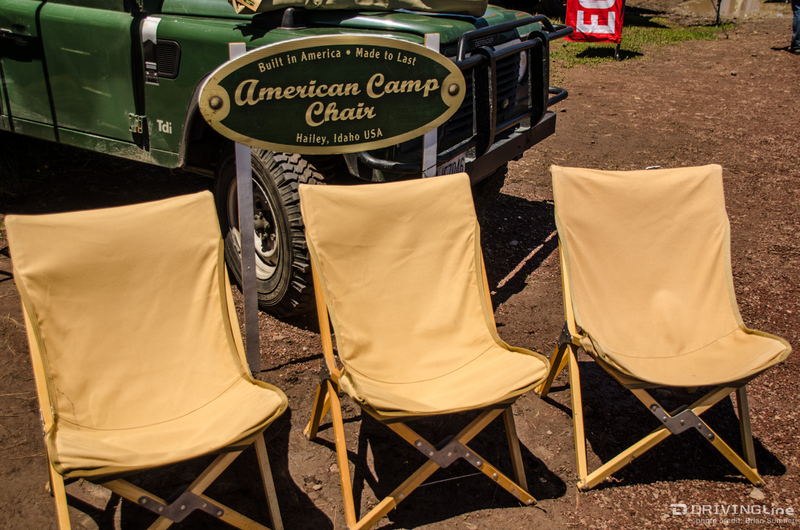 The American Camp Chair chairs are a newer take on an old design known as the Fenby safari chair. The chair design has been proven on military campaigns, expeditions, safaris and outings all over the world. The Ranger model chair as seen here is made from cedar and stainless steel construction using a number 8 canvas duck material for the seat. The chair comes with a ballistic nylon carrying bag. 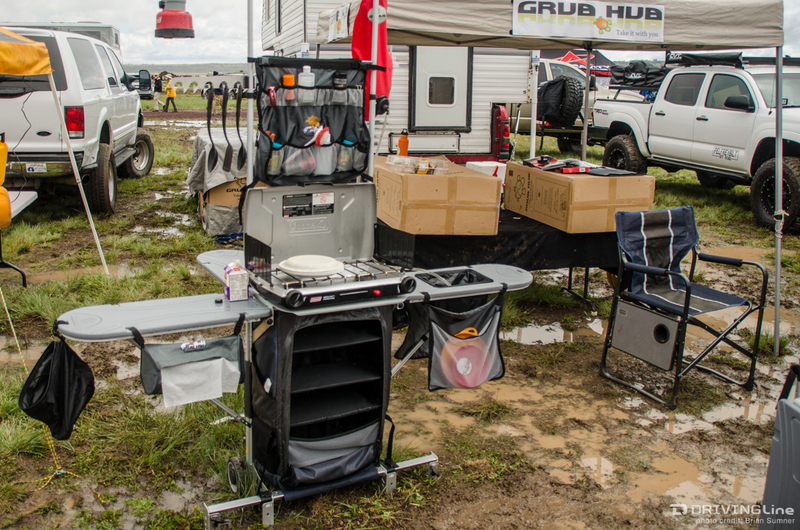 The Grub Hub is an outdoor kitchen that organizes all of your cooking supplies into one portable unit on wheels. It's made with an aluminum frame and will fit a typical 2-burner camp stove along with providing 9 square feet of table space when unfolded. 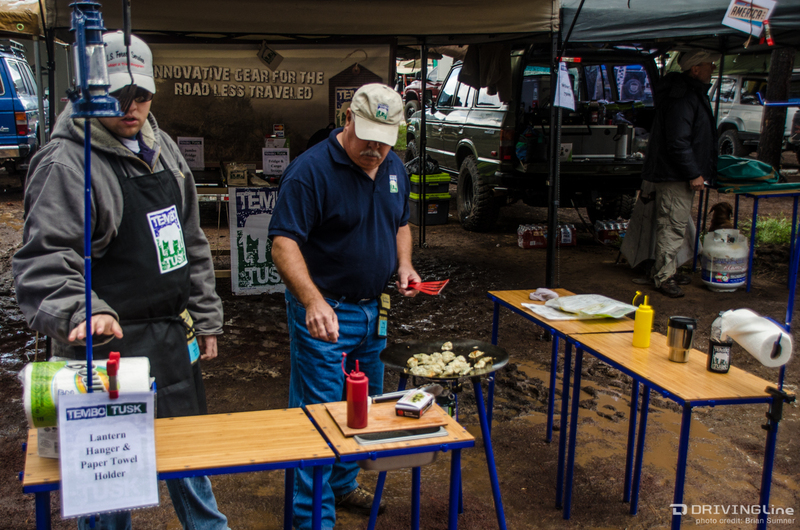 On Sunday morning, the kitchen was being used to cook breakfast for everyone who came by their booth and to illustrate the convenience of using an all-in-one camp kitchen system. What are your favorite pieces of camping gear? Let us know in the comments below!